That you can do things you’re good at. I don’t cook as much as I used to. I used to love to cook and it was my main creative outlet. Then things happened, and I cut back for years. It’s not as easy or fun now—it’s not as 2nd nature as it used to be, food is way more expensive, and I have a super taster palate. I’m picky about food, particularly what I make myself. But tonight, it all came together. So simple, so delicious, and so freaking good. 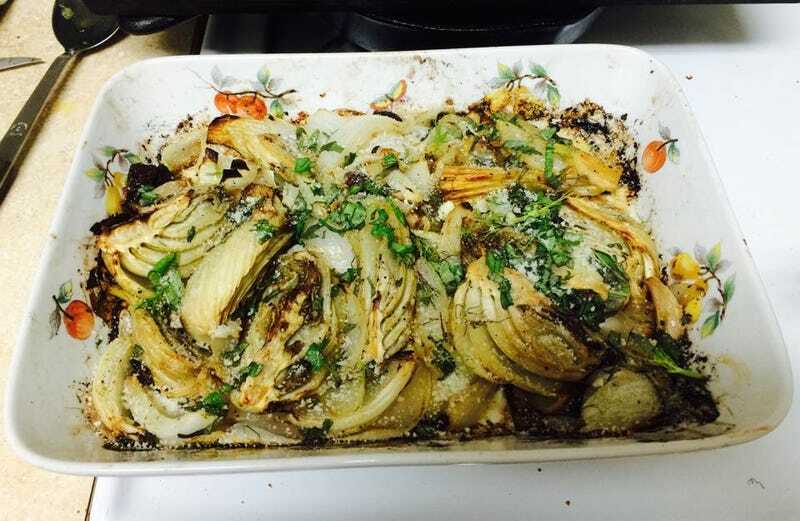 Behold, Roasted Fennel and Sweet Onions, with Garlic, Olives, Basil, and Pecorino Romano. It was a masterpiece. Perfectly balanced. Perfectly cooked. I wish it looked prettier, but damn if I’m not proud of myself. I served it with rotisserie chicken in gravy (made with my own chicken stock.) And it’s nice to have a friend/neighbor in my building, because having another person around inspires me to cook more. And I’m sure she doesn’t mind eating well. My tummy is pretty freaking happy.